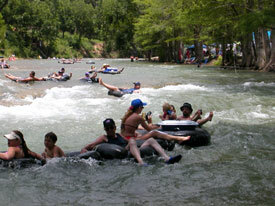 Tubing on the Guadalupe River at it's best! We're located 12 miles west of New Braunfels, exit 191 off Interstate 35. 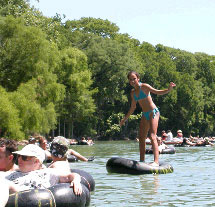 River Sports is uniquely located on the Guadalupe River right in the middle of the famous Horseshoe Loop, so getting into and out of the river simple and quick! Tube all day for one low price and choose from our Short Float, Medium Float, and/or our Long Float - see the maps below. At the end of your float trip, we will pick you up with our Shuttle*. 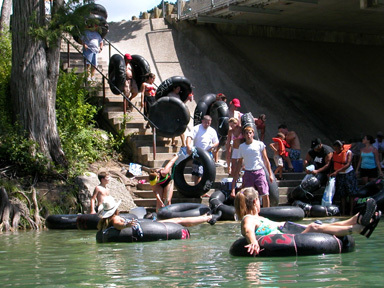 Experience the best river tubing in Texas! Don't forget your Coupon! We offer Military Discounts and Group Rates too! Rental Information and Pricing - All Day Tubing! Minimum Age Requirement: 5 years old or older. Age limit may change with water conditions. Take advantage of our Coupon offer! You can bring your own cooler or rent one here. 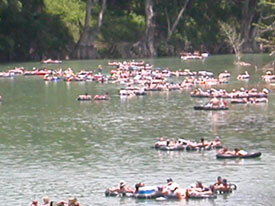 There are no restrictions on cooler size at Canyon Lake, but coolers larger than 48 quarts may not fit in our tubes. You can bring your own cooler or rent one here. 1 trip is included with all Tube Rentals or when you pay for your own Private Equipment. Additional Shuttle Trips are $5 per trip / per person. with tube rental or paid private equipment fee. Life jackets are required by law on all boats/crafts, but not for tubes. Weekdays - Monday through Friday - including Holidays! $6 OFF each Tube Rental. include all day tube rental and one 4th Crossing shuttle bus service. Weekends -Saturday and Sunday - including Holidays! $5 OFF each Tube Rental. include all day tube rental and one 4th Crossing shuttle bus service. Your Choice: A Short, Medium or Long Float! 1/2 to 2 Hours, depending on River Levels River Levels vary Daily! Tube the "Loop" all day, until closing! Take a lunch break & tube some more! 2 to 4 hours depending on River Levels River Levels vary Daily! 1-1/2 miles in length, begins at the end of the "Horseshoe Loop", (see small "red square" exactly at the Bridge near the "Campgrounds" where Map says: "BEGIN MEDIUM FLOAT"). This Float does not include the "Horseshoe Loop" section of the river. Our Medium Float ends just past the 4th Crossing Bridge indicated by a "red square" and where the Map says "END MEDIUM FLOAT". 3 to 6 hours depending on River Levels River Levels vary Daily! 2 1/2 miles in length, this Float combines our "Short Float" and our "Medium Float" together. It starts at the beginning of the "Horseshoe Loop" where the Map says "ENTRY" "BEGIN LONG FLOAT HERE", and ends just past the 4th Crossing Bridge indicated by a "red square" and where the Map says "END LONG FLOAT". Tube Rentals include one shuttle trip. Additional shuttle trips are $5 per trip / per person. To qualify for our Group Rates you must make "ONE PAYMENT" for your Group! You will not be considered a Group if paying individually. PLEASE ask our Cashier the total amount due for your Group, then have one person collect the money from each Group Member to make one payment for your Group at rental time! Thank You! $4 OFF each Tube Rental. include all day tube rental and one 4th Crossing shuttle bus service. $3 OFF each Tube Rental. include all day tube rental and one 4th Crossing shuttle bus service. © 2017 River Sports Tubes All Rights Reserved.